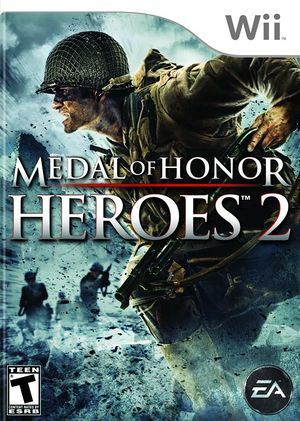 Medal of Honor: Heroes 2 is the 12th installment in the long-running Medal of Honor series of World War II games. It is set in World War II, starting on the Normandy beaches trying to control German bunkers and then move on to secure a village somewhere in France. This is the second Medal of Honor game to be released for the Wii. The first was Medal of Honor: Vanguard. Medal of Honor: Heroes 2 uses the VP6 video codec, common in Electronic Arts' titles, causing it's videos to have vertical line artifacts and other glitches on NVIDIA graphics cards. The Software Render will display VP6 video correctly, but is typically too slow. Prior to 4.0-593 video output was completely scrambled, refer issue 5046. Rendering improved with 4.0-593 but a variety of glitches remain, refer issue 7193. VP6 rendering also reacts poorly to the Force Texture Filtering enhancements (and Anisotropic Filtering on NVIDIA), causing further scrambling. 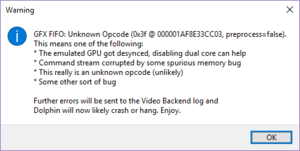 When starting play Unknown Opcode errors occur, and things render incorrectly with flickering and a black box displayed in the lower right corner and eventually hanging. Refer issue 10761. These can be partially fixed by replacing the 00000015.tik file. Download this file, extract the 00000015.tik file, and put into the %userprofile%/Documents/Dolphin Emulator/Wii/ticket/00000001/ folder. Warning messages may still occur, but the game emulation will not hang. The graph below charts the compatibility with Medal of Honor: Heroes 2 since Dolphin's 2.0 release, listing revisions only where a compatibility change occurred. This page was last edited on 28 May 2018, at 01:57.